So John 8:44 speaks the father of the Devil. This is the same god the Jews worship, the one who created the world and gave them the many commandments of the law. Elsewhere in the same speech (John 8:12ff) in the Temple Jesus proclaims that his own father is unknown to the Jews. If the Jews knew the Father of Jesus they would not be seeking to kill him. So in chapter 8 of the Gospel of John Jesus speaks of two different fathers — one is the father of Jesus and those who believe in him and keep his commandments; the other is the father of the Jews and the Devil. April DeConick further argues that this claim about the Jews’ parentage is in effect a claim that the Jews by nature sinners — liars and murderers. Christians, or the people of the Church, Jesus is supposedly saying, are by nature sinless because they belong to a different family, begotten by a different Father. An early step toward gnosticism? and a lower god, morally flawed, who created and ruled the world. This latter God was the God of the Jews, the one responsible for the law and also for the Devil. I will leave it to interested readers to unpack the details of DeConick’s argument and the history of the translations of this verse, along with the early theological debates surrounding its meaning. The point to be made here is that this verse has been used by “Gnostics” to demonstrate that Jesus spoke of the God of the Jews (the Old Testament Creator God) as the Father of both the Devil and the Jews, while Jesus himself came from a higher God, another Father unknown to the Jews. This was a Jewish development that immediately preceded the “more developed” system of Basilides. Basilides incorporated a “cosmology” from Platonic philosophical concepts in which the highest God (all good and father of Jesus) existed in a “space” completely aloof from the created celestial spheres. At the head of the celestial realm was Abrasax, and well below him, god and ruler of the sublunar region where the world is, is found the malicious God of the Jews. Later gnostic systems replaced Abrasax with the God of the Jews, some making him fundamentally a righteous deity and others insisting he was immoral. Below him, just above the earth, was the Devil. The ultimately pure and ineffable God (with Jesus) dwelt beyond all of these mutable created places and beings. Or the system of the ex-Marcionite, Apelles? 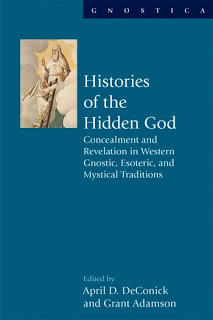 Against DeConick’s view that the Gospel of John points to a very early and transitional phase towards the later gnosticism of Basilides, the Valentinians and others, Roger Parvus argues that the same theology April DeConick identifies is actually the one attributed in the patristic record to the an apostate from Marcionism, Apelles. rejected Marcion’s gospel and composed his own, borrowing from other gospels and including a scene in which the resurrected Jesus has a side-wound. Apelles’ “god-system” appears to fit what DeConick finds in the Gospel of John. The supreme God is the direct creator of the larger universe while a lesser God created the world itself. This lower God was the God of the Jews. April DeConick discusses the evidence for an argument among those who interpreted the Gospel of John literally and others (led by a “presbyter” who authored the epistle of 1 John) who interpreted the Gospel in a way that is closer to our “orthodox” understanding. Those opposed to the presbyter and author of 1 John taught that the Logos or spirit of Christ came by “water only” — that is, he came into the world through Jesus’ baptism — and not through “water and blood”, or through birth to Mary as well as through baptism. I think Apelles’ understanding of the way the Word became flesh (by taking on cosmic elements as he descended to earth through the heavens) and then entered the world “by water” (baptism only) qualifies as one side of the argument DeConick identifies. See DeConick’s article for a fuller explanation of her own viewpoint. DeConick points out the problem of the Gospel Jesus appealing to passages in the Jewish scriptures to verify his words and condemn the Jews: how could he do this if he was saying the God of the Jews, the Lawgiver, was the lesser God and not the true Father? That question would be simply resolved if we see in the Gospel of John the Apellean teaching that there were a few elements in the Scriptures that had been truly inspired. April DeConick sees the shadow of Cerinthus lurking behind the Gospel of John. Roger Parvus, Apelles. The advantage of Roger’s argument as I see it is that it can explain the unorthodox feartures in the Gospel of John by reference to known evidence. I think April would say the advantage of hers is that it posits a conceptual link between orthodox Jewish ideas about God and subsequent Gnosticism. Posted on 2013-12-11 13:12:54 GMT+0000 by Neil Godfrey. This entry was posted in Biblical Studies and tagged April DeConick, Gnosticism, Gospel of John. Bookmark the permalink. According to a passage in the “Refutation of All Heresies” by Hippolytus, Apelles taught that there were two principal angels/deities who are evil. Harnack was puzzled by this and thought that Hippolytus must have been mistaken (“Marcion— The Gospel of the Alien God,” p. 171, footnote 78). But now after reading DeConick’s article I am not so sure. From other patristic references to Apelles it is clear that he taught there was one supreme God who was the Father of Christ. And he taught that a glorious angel of theirs created the world with the best of intentions, but that his work turned out defective. And he taught the existence of the “fiery one” i.e., the angel who deceived the Jews (“Apelles concocted some kind of . . . god of the Law and of Israel, affirming him to be of fire” – Tertullian’s ‘On the Prescription of Heretics,’ 34). But the above text from the Refutations of Hippolytus is the only one that attributes to Apelles a belief in an additional evil angel/deity. It doesn’t say this evil angel was the son of the Fiery One but, in light of DeConick’s article, that possibility will have to be kept in mind going forward. Epiphanius has Apelles teach 3 gods: The Good God (both Father and Christ), the Creator, the Devil who is acknowledged as an angel created by the Creator and yet nonetheless called a god by Epiphanius. In the end, I think sometimes the distinctions between the systems are made up by the heresiologists to pretend that the heretics wee deeply divided. For example when they say that Apelles rejected Marcion’s system and changed it. Seems to me more likely that they are the same. Of course it could also be that the heresiologists just don’t understand the systems. If Marcion wrote in Syriac and Apelles in Greek, that would explain why they might not realize the two system were actually the same. It would make sense, after all, for the first system, especially coming from the East, to be in the Syriac language. And the identification of the gospel of John with Cerinthus has something going for it that the identfication with Apelles does not: John’s Gospel was in ancient times attributed to Cerinthus by Gaius of Rome. Of course, there is also the antimarcionite prologue to John which suggests that Marcion lived in the time of the John who wrote the gospel of John (which the prologue claims was the apostle John), and was “expelled” by him. The mention of Marcion makes no sense considering the orthodox chronology, unless it is meant as a way to explain why the gospel of John sounds Marcionite…i.e. Marcion was around at the time and somehow influenced John even though John “expelled” him he may have expelled him a bit late and already been himself infected with Marcionism. You wrote that, according to Epiphanius, Apelles taught that the Devil is “an angel created by the Creator.” Could you provide the quote from Epiphanius for that? And which translation you are using? Thanks. This hasn’t hitherto escaped notice. In Christianity its called Marcionism; and in Judaism its called the “two powers in heaven” heresy. And it also hasn’t escaped notice that John’s Gospel was originally a Marcionite text. See Joseph Turmel on the Marcionite Origin of the Fourth Gospel. Its escaped the notice of mainstream scholars perhaps, because they like to be willfully ignorant of such things. But Turmel didn’t notice this particular aspect of 8:44, or if he did, Daniel Mahar didn’t translate that part of Turmel’s book. This is something I’ve never encountered before. DeConick is saying that what has escaped notice is the evidence of John 8:44 in support of this theological system. She is aware of the scholarly interpretations, including the Marcionite thesis in relation to Gospel of John. But her argument is that the Gospel of John represents a stage of theological development that preceded Marcionism. April DeConick outlines the history of the interpretation of John 8:44 and is stating that a particular interpretation of that passage has escaped notice in modern scholarship. If there’s one thing now very apparent, it’s that the Gospel of John IS Gnostic. That opening chapter can be nothing else. It’s just a matter of detective work to find out WHICH of the Gnostics was responsible for its creation…Cerinthus, Appelles, Valentinus…but I can no longer consider it proto-Orthodox/proto-Catholic or even purporting to be of any 1st century person. The “Two Powers in Heaven” heresy seems to be the only thing early-second century rabbis were dealing with. For all the claims of Christians since the late-second century, it’s doubtful sectarians they had to deal with in the late-first century were even akin to Christians as we know them. One can see the various threads in Judaism that might have led to at least the Marcion style, but no clear indication of proto-Orthodox/proto-Catholic. Still points to gnostic-first more than anything else. But what’s really hilarious is that the proto-Orthodox Christians actually gave INDEPENDENT witness to the succession of the Gnostic thought-leaders. Independent and hostile witness. In doing so they probably proved the Gnostics’ existence and teachings much better than their own viewpoints. Perhaps this is why they decided to burn the Library of Alexandria. Evidence of Gnostic-first? Independent witnesses and sources? Destroy the evidence disproving their own line? So far as I can tell the proto-orthodox never give us a publication date for their own canon. No information on who collected the writings up and when. But they do give us that for Marcion’s canon: Tertullian says 115 years after Jesus, presumably to be understood as meaning after the crucifixion. Let’s remember that around the later second century the proto-Orthodox by their own accounts were still a minority amongst all the rest. And there were still other books and other gnostic gospels around. The closest real canonisation of what we perceive as the New Testament was way later than Marcion’s version. Around the 395a.d. mark. Give or take a few years. Up to this year I always wondered why it took that long. Now I’m getting a better idea of why. But such a difference between Marcion’s canon time, first half of second century, and the Catholic Canon time of late fourth. It is not an early step towards gnosticism, but a late and faint echo thereof due to many interpolations and glosses that were necessary to cause the impression that Jesus fulfilled the Law and the Prophets by performing the signs and miracles of the OT.